Real estate themed jewelry, watches, accessories and more. A great passive way to market that you are in Real Estate, or that you are a Realtor. 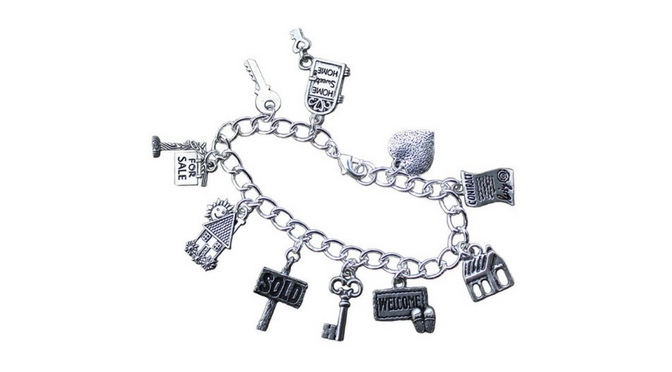 A selection of ladies charms, necklaces, bracelets, and fine jewelry, most with a real estate theme. Take a look at outstanding watches, rings, bracelets, and other mens jewelry with a real estate theme, or the Realtor logo. Other jewelry offered by Amazon with a real estate them, or Realtor logo. Just like jewelry, whether specific to real estate? This a partial selection of the numerous offerings at Amazon. If you have jewelry, whether men’s or women’s, you have to have somewhere safe to store it. Take a look at the current offerings below!